Chabahar Port (Persian: بندر چابهار‎) is a seaport in Chabahar located in southeastern Iran, on the Gulf of Oman. It serves as Iran's only oceanic port, and consists of two separate ports named Shahid Kalantari and Shahid Beheshti, each of which has five berths. The India–Iran–Afghanistan three-way memorandum of understanding (MoU) plans have committed at least $21bn to Chabahar–Hajigak corridor, including $85m for Chabahar port development by India, $150m line of credit by India to Iran, $8bn India-Iran MoU for Indian industrial investment in Chabahar Special Economic Zone, $11-billion Hajigak iron and steel mining project awarded to seven Indian companies in central Afghanistan, and India's $2bn commitment to Afghanistan for developing supporting infrastructure including the Chabahar-Hajigaj railway, with potential for several times more trade via connectivity to 7,200-km-long multi-mode North–South Transport Corridor (INSTC) connecting to Europe and Turkey, R297 Amur highway and Trans-Siberian Highway across Russia, and planned Herat to Mazar-i-Sharif railway providing access to Turkmenistan, Uzbekistan, Tajikistan and Kyrgyzstan. Chabahar Port also provides direct access to India's Farkhor Air Base in Tajikistan. Chabahar route will result in 60% reduction in shipment costs and 50% reduction in shipment time from India to Central Asia. Development of the port was first proposed in 1973 by the last Shah of Iran, though development was delayed by the 1979 Iranian Revolution. The first phase of the port was opened in 1983 during the Iran–Iraq War as Iran began shifting seaborne trade east towards the Pakistani border in order to decrease dependency on ports in the Persian Gulf which were vulnerable to attack by the Iraqi Air Force. India and Iran first agreed to plans to further develop Shahid Beheshti port in 2003, but did not do so on account of sanctions against Iran. As of 2016, the port has ten berths. In May 2016, India and Iran signed a bilateral agreement in which India would refurbish one of the berths at Shahid Beheshti port, and reconstruct a 600 meter long container handling facility at the port. The port is intended to provide an alternative for trade between India and Afghanistan. This port is 800 kilometers closer to Afghanistan than Pakistan's Karachi port. The port handled 2.1 million tons of cargo in 2015, which is planned to be upgraded to handle 8.5 million tons by 2016, and to 86 million tons in the future. In July 2016, India began shipping US$150 million worth of rail tracks to Chabahar to develop the port container tracks and build US$1.6 billion Chabahar–Zahedan railway built by India's Ircon International for which India pledged additional US$400 million and Iran allocated US$125 million in December 2016, thus taking the total allocation to US$575 million (out of US$1.6 billion needed for the rail route) till the end of 2016. In October 2017, India's first shipment of wheat to Afghanistan was sent through the Chabahar Port. In December 2018, India took over the port's operations. Boats anchored in Chabahar Bay. The port of Chabahar is located on the Makran coast of Sistan and Baluchistan Province, next to the Gulf of Oman and at the mouth of Strait of Hormuz. It is the only Iranian port with direct access to the Indian Ocean. Being close to Afghanistan and the Central Asian countries of Turkmenistan, Uzbekistan etc., it has been termed the "Golden Gate" to these land-locked countries. Chabahar is 700 km (430 mi) away from Zahedan, the capital of the Sistan and Baluchistan province, 950 km (590 mi) away from Milak, the closest city to the Afghan border, and 1,827 km (1,135 mi) away from Sarakhs on the Turkmen border. The marine distance to Dubai is 353 nautical miles (654 kilometres; 406 miles), Karachi in Pakistan is 456 nmi (845 km; 525 mi), and Mumbai in India is 843 nmi (1,560 km; 970 mi) . Pakistan's Chinese-funded deep sea port at Gwadar is also on the Makran coast, at a distance of mere 76 nautical miles. Gwadar also claims to provide access to Central Asia, and comparisons between the two ports are frequently made by analysts. Because 90 percent of Iran's population is concentrated in the western part of the country, the eastern part is relatively less developed. Iran is intending to change that by the development around Chabahar port, with a free trade zone, and road and rail links between Chabahar and Central Asia. Its plan is to use Chabahar port as the gateway to Central Asia and maintain the Bandar Abbas port, which currently handles 85% of Iran's seaborne trade, as a hub for trade with Russia and Europe. The highly congested Bandar Abbas port is not a deep water port and cannot handle the 250,000 ton ocean-going cargo ships. At present, such ships dock in the United Arab Emirates (UAE) and the cargo is transferred to smaller 100,000 ton ships for onward shipment to Iran. This makes Iran dependent on the UAE for shipments and represents a loss of revenue. Unlike Bandar Abbas, Chabahar has the ability to handle standard cargo ships. A former port named Tis in Chabahar's neighborhood dates back to 2500 BC, known during Alexander the Great's conquests. Alberuni wrote that the sea coast of India commences with Tis. The Portuguese forces under Afonso de Albuquerque gained control of Chabahar and Tis, staying there until 1621. The British, and later the Portuguese in the 17th century entered this region. Modern Chabahar dates back to around 1970, when it was declared a municipality, and large port projects were started by order of Mohammad Reza Pahlavi, the Shah of Iran. The Shah planned to construct a $600 million naval base at Chabahar, mostly employing American companies as contractors. The American naval officials held talks with their Iranian counterparts on securing an "option" to operate out of Chabahar in the event of an emergency. However, in 1977, the Shah got strapped for cash, caught in a tug of war between the OPEC and western oil companies over oil prices, and the construction of Chabahar base was postponed. Soon afterwards, the Shah was overthrown in the 1979 Iranian revolution. After the Iranian revolution, the foreign companies left the projects and Iranian public companies linked to the Ministry of Jahad-e Sazandegi (or jihad for construction) took them over. The Iran–Iraq War (1980–1988) caused Chabahar to gain in logistical and strategic importance. War brought insecurity to the Strait of Hormuz and ships were unable to enter the Persian Gulf. Accordingly, Chabahar became a major port during the war. The Chabahar port actually contains two separate ports called Shahid Kalantari and Shahid Beheshti. Between 1982 and 1983, Iran constructed four 45 meters (150 feet) berths at Shahid Kalantari and four 150 meters (492 feet) berths at Shahid Beheshti. Two larger berths, 235 meters (771 feet) and 265 meters (869 feet) meters long, were constructed in 1997 and 2004 respectively. Consistent with its desire to be seen as a significant regional player, Iran has taken the initiative to engage with all the neighbouring countries to enhance the transit potential of Chabahar. It has signed a memorandum of understanding (MoU) with Afghanistan and Tajikistan on the construction of railway lines, water pipelines and energy transmission lines. It has been keen to extend the Khvaf-Herat rail line to connect to the railways of Central Asia, Turkey, and Europe. It has entered into an agreement with Oman, Qatar, Turkmenistan and Uzbekistan to establish a transport corridor between these countries. It is also a key partner in the International North-South Transport Corridor (INSTC) along with Russia, Ukraine, Turkey, Oman, Syria, India and the Central Asian countries, which aims to connect South and Central Asian countries to Northern Europe via Iran and Russia. Specifically with respect to Chabahar, Iran has envisioned it as a key port in linking India with Afghanistan and Central Asian countries. Initiatives in this regard include a roadway from Chabahar to Milak on the Afghanistan border, Chabahar-Faraj-Bam railway, Chabahar-Zahedan-Mashhad rail link, which will be further extended to Herat and Mazar-e-Sharif in Afghanistan and Termez in Uzbekistan. Iran also plans to build the Iranrud, Suez canal like canal through Iran to connect Caspian sea with Persian gulf. In 2016, India signed a deal with Iran entailing $8 billion investment in Chabahar port and industries in Chabar Special Economic Zone, including an aluminium smelter and a urea making facility, at Chabahar port is being developed was a transit route to Afghanistan and central Asia. India has already built a 240-km road connecting Afghanistan with Iran. Also in planning is a rail route connecting Chabahar with the India-promoted $11-billion Hajigak iron and steel mining project in central Afghanistan, as seven Indian companies in 2011 acquired rights to mine central Afghanistan’s Hajigak region, which contain Asia’s largest deposit of iron ore. The Government of India has pledged to Afghanistan to spend $2bn in developing supporting infrastructure including Chabahar to Hajigaj railway. All this will bring cargo to Bandar Abbas port and Chabahar port, and free Kabul from its dependence on Pakistan to reach the outer world, giving India access to Afghanistan and beyond to Turkmenistan, Uzbekistan, Tajikistan, Kyrgyzstan, Kazakhstan, Russia and Europe via 7,200-km-long multi-modal North–South Transport Corridor (INSTC). During the 1990s Iran and India, along with Russia, collaborated in backing the Northern Alliance in Afghanistan against the Pakistan-backed Taliban. At this time, Iran invited India to develop the Chabahar port to obtain ready access to Afghanistan. In 1997, a trilateral agreement was signed with Turkmenistan to expand trade into Central Asia and, in 2000, another agreement with Russia to provide seamless transport between India and Europe via an International North-South Transport Corridor. After the American presence in Afghanistan, India, Iran and Afghanistan got together in January 2003, agreeing on a joint development of transportation links to Afghanistan. India agreed to expand the Chabahar port and to lay a railway track between Chabahar and Zaranj. Iran has completed 70 percent of the first phase of the Chabahar project at a cost of $340 million. India has spent $134 million during 2005–2009 to construct a road from Delaram in Afghanistan to Zaranj at the Iran-Afghanistan border. Iran has also built a roadway between Milak, close to Zaranj, and Chabahar passing through Zahedan and Iranshahr. Through Milak, Zaranj and Deleram, connectivity has been established to the Afghan `garland road', which connects the major Afghan cities Herat, Kandahar, Kabul and Mazar-e-Sharif. In March 2012, ships from India docked at Chabahar carrying 100,000 tonnes of wheat under humanitarian aid to Afghanistan. The Afghan businesses have begun to shift from the Karachi port to Chabahar port for transit. However, without further development of the Chabahar port, these road links would remain underutilized. Despite intentions, India's involvement in the infrastructure development within Iran has been minimal, possibly due to the western pressure to apply sanctions. Iran is also believed to have a shown a preference for Iranian contractors instead of Indians. The initiative was restarted in August 2012 in a trilateral meeting on the sidelines of a Non-Aligned Summit. "This is a very, very crucial agreement for Afghanistan. The opening of this corridor will help us to fully reach our potential, give us a new trade route. This is a completely new chapter". — Shaida Abdali, Afghan ambassador to India, April 2016. Afghan President Ashraf Ghani, Indian Prime Minister Narendra Modi, and Iranian President Hassan Rouhani at the signing of the trilateral transit agreement between the three countries in May 2016. In May 2016, India signed a series of twelve memorandum of understandings which centered upon the Port of Chabahar. The trilateral transit agreement signed by India, Iran and Afghanistan allows Indian goods to reach Afghanistan through Iran. It links ports in the western coast of India to the Chabahar port and covers the road and rail links between Chabahar and the Afghan border. The bilateral agreement between India and Iran gives India the right to develop two berths of the Chabahar port as agreed in 2015 and allows them to be operated for 10 years by India Ports Global, a joint venture between Jawaharlal Nehru Port Trust and Kandla Port Trust, in partnership with Iran's Aria Banader. India Ports Global has guaranteed handling of 30,000 TEUs by the third year of operations, and aims to eventually handle 250,000 TEUs. The berths will be developed at a cost of $85 million over the course of 18 months. Under the agreement, India Ports Global will refurbish a 640 meters (2,100 feet) long container handling facility, and reconstruct a 600 meters (1,970 feet) long container handling facility at the port. India Ports Global will modernize ancillary infrastructure by installing four rail-mounted gantry cranes, sixteen rubber-tire gantry cranes, two reach stackers, two empty handlers, and six mobile harbor cranes. Upon completion of upgrade works agreed to in the May 2016 agreements, Chabahar's capacity will be increased to 8 million tons from the current 2.5 million ton capacity. The investment is supplemented with a $150 million credit line to Iran through the Exim Bank of India. India has also offered to supply $400 million worth of steel towards the construction of a rail link between Chahbahar and Zahedan. Indian commitments to Iranian infrastructure could total $635 million as per the twelve memoranda of understanding signed in May 2016. As per the deal, India will also be developing various industries, including aluminum and urea production plants, in the Chabahar economic zone attached to the port. Iran's ambassador to Pakistan, Mehdi Honerdoost stated that Pakistan and China had both been invited to contribute to the project before India, but neither China nor Pakistan had expressed interest in joining. On 29 October 2017, the trilateral transit trade and rote was implemented when first shipment of wheat was sent from India to Afghanistan via Chabahar. India is finalising a plan to construct a 900-km Chabahar-Zahedan-hajigak railway line that will connect Port of Chabahar in Iran, being built with Indian help, to the mineral-rich Hajigak region of Afghanistan. In 2011, seven Indian companies acquired rights to mine central Afghanistan’s Hajigak region, which contain Asia’s largest deposit of iron ore. The Government of India has pledged to spend $2bn in developing supporting infrastructure. In May 2016, a MoU was also signed for financing of the planned Chabahar–Zahedan railway section of Chabahar–Zahedan-hajigak railway, as part of North–South Transport Corridor, by Indian Railway's public sector unit Ircon International. India has offered to supply approximately $400 million worth of steel towards the construction of this railway, while India has also offered to finance construction of the Chabahar to Zahedan rail line at a cost of $1.6 billion. India began shipping rail tracks worth US$150 million in July 2016 and in December 2016 Iran also allocated US$125 million for towards this rail route. Chabahar's connection to the country's railway plan is under study and consideration. 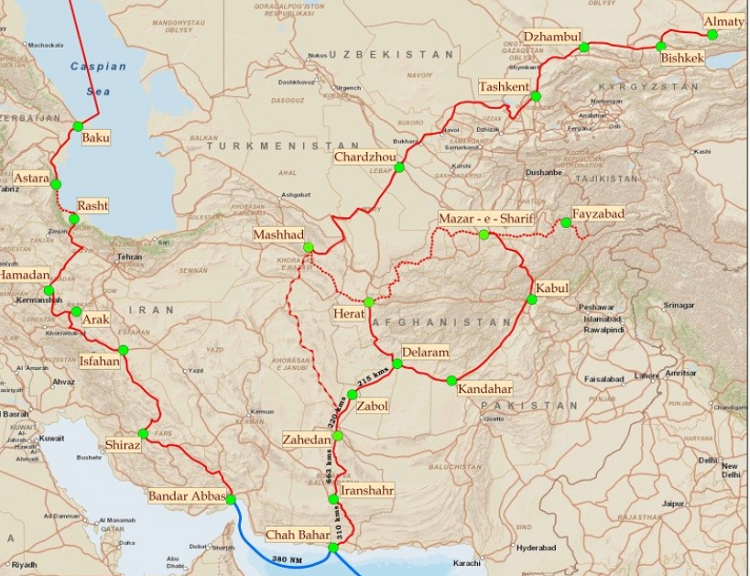 A rail link between Chabahar and Zahedan, when completed, can connect Chabahar to the Kerman–Zahedan railway and further to the Trans-Iranian Railway. Mashhad in north east Iran to Herat in north west Afghanistan rail route has four sections, two each in Iran and Afghanistan. Within Iran, saction-1 from Khaf to Sangan 14 km route was completed in September 2016 and saction-2 from Sangan to Iran-Afghanistan border at Shamtiq (Shematigh, Shmtygh, شمتیغ) 62 km was completed in October 2017. Within Afghanistan, saction-3 from Iran-Afghanistan border at Shamtiq–Jono (Jonaw, Junaw) to Ghurian 61.2 km route was completed in October 2017 and section-4 is Jono to Herat Italy-supported 63 km route. Herat is already linked with Turkmenistan via rail and road routes. India and Afghanistan plan to extend rail route from Herat to Mazar-i-Sharif. Mazar-i-Sharif is already linked with Uzbekistan and Tajikistan via rail as well as via road routes with other central Asian nations. India's minister of Road Transport and Highways Nitin Gadkari also stated that Indian companies could potentially invest over ₹1 lakh crore (US$14 billion) in the Chabahar Special Economic zone. He however stated that potential investments would depend on whether Iran would be willing to supply Indian projects with natural gas at tariffs substantially lower than those offered by Iran. In March 2017, India has invited expression of interest from private parties to manage the port for 10 years, Adani Group and Ruia family's Essar Group are interested, and India announced that port equipment such as crane etc. will be procured soon. In March 2017, India is already running training in Nagpur for the Afghan customs officials to be posted at Iran-Afghan border customs post built by India on the road built by India and Afghan ambassador to India announced that Indian shipments to Afghanistan via Chabahar will commence soon. On 29 October 2017, the port and road transit to Afghanistan was operationalized when first shipment of wheat was sent to Afghanistan. In August 2017, Indian Union Minister of Ports, Nitin Gadkari, informed at an event in Iran that the civil work at Chabahar port developed by India is complete, and the Indian government is ordering INR 400 crores (USD63 million) worth of mechanised equipment and cranes, and the port will be operational in 2018 to export Indian wheat to Afghanistan. after meeting with Iranian President Hasan Rouhani, he said "now, we are building a railway line in Iran. From Chabhar, we can go to Afghanistan, Uzbekistan and Russia." In August 2017, India Global Ports Limited (IGPL) had applied for the permission to run the Chabahar port in the interim, while Iran has already completed the construction of jetty and IGPL will build two new terminals, one for the containers and another for the multi-purpose ships. In October 2017, IGPL had already started constructing the terminals after placing order for the construction equipment. On 29 October 2017, the first shipment through the port was sent from India en route to Afghanistan. To demonstrate the viability of the route, seven shipments of wheat as aid to Afghanistan were planned to be sent by India by the end of January 2018. On 3 December 2017, the first phase of the port construction was inaugurated by Iranian President Hassan Rouhani. In January 2018, Iran and India signed an agreement worth $2 billion for cooperation in the rail sector. A part of the agreement pertains to a memorandum of understanding worth $600 million for Iran to purchase locomotives and freight cars from India. In November 2018, The United States has exempted the multinational Chabahar port project from its sanctions against Iran due to its economic importance to Afghanistan. American policy analyst Rorry Daniels has characterized both the Indian investment in Chabahar and the Chinese investment in Gwadar as generating perceptions of "strategic encirclement". According to her, China fears encirclement by the US, India by China, and Pakistan by India. All of these encirclements are seen by the respective countries as "containment strategies", which they attempt to break out of. Indian news commenter Shishir Gupta described India's Chabahar Port deal as "a counter to the China-Pakistan Economic Corridor," as it has "broken through the strategic encirclement by China and Pakistan." Scholar Neil Padukone however disagrees that India has a goal of encircling Pakistan. India needs access to iron from Afghanistan's Hajigak mine and other natural resources from the Central Asian countries of Kazakhstan, Turkmenistan, and Uzbekistan, which is made possible by the Chabahar port. But, in the long run, the pipeline-to-road-to-rail-to-sea-to-road shipment costs through Chabahar should be circumvented by direct transit through Pakistan. So far, Pakistan has been reluctant to provide such access. The US State Department does not currently see military cooperation between Iran and India as part of the Chabahar project, although it has cautioned India to remain within the legal parameters with respect to collaboration with Iran. The US also sees the Indian presence in greater Central Asia beneficial for spreading the soft power of democratic and friendly regimes. India hopes to see the Western countries use the Chabahar route to link to Afghanistan and reduce their dependence on Pakistan. Comments in the Chinese Press have indicated that China is unlikely to see India's efforts as strategic competition and that India's contribution to the infrastructure development in Central Asia will also benefit Chinese multinational corporations. Padukone agrees that India has need for establishing a "naval counterweight" to China's presence in Gwadar, as India sees the Gwadar Port as a manifestation of a strong China–Pakistan alliance that seeks to choke Indian investments in the Indian Ocean region. Scholar Christophe Jaffrelot states that Gwadar gives the Chinese a key listening post to monitor US and Indian naval activity in the Persian Gulf as well as a dual-use civil-military base for Chinese ships and submarines. India perceive a direct threat and its response has been to help build the Chabahar port. Iran has stated that Chabahar is not a rival to Pakistan's Gwadar and invited Pakistan to join in its development. Pakistani analysts have endorsed the view, stating that Gwadar has an advantage by being a deep sea port and the expansion of Chabahar would in fact expand trade through Gwadar. Larger vessels that cannot dock at Chabahar could dock at Gwadar and the cargo transshipped to Chabahar. Pakistan's foreign policy advisor Sartaj Aziz has signalled that Pakistan may link the Gwadar port to Chabahar. However, Pakistani military commentators have characterised the alliance between India, Iran, and Afghanistan as a "security threat to Pakistan", and it had "ominous and far-reaching implications" to the region. Segments of the Pakistani press bemoaned the country's increasing "isolationism". In light of trade restrictions imposed on Iran by USA, India had reduced oil imports from Iran, but USA has not intervened directly in the port's development because "conservative analysts in (Washington) DC have accepted the fact that India will maintain some form of relationship with Iran, Iran is more about a transport corridor to Afghanistan; that it has no interest in advancing Iran's agenda in the Middle East; and that whatever space India evacuates there will be filled by China", South Asia expert at "The Heritage Foundation" in Washington Jeff Smith said in November 2017. Iran's Sistan and Baluchestan Province, site of Chabahar port, is also the stage for insurgent activity by the insurgent group Jundallah, which claims to be fighting for the rights of Sunni Muslims, and the local ethnic Baloch. In 2010, Jundallah militants dispatched a suicide bomber to a Shi'ite mosque in Chabahar, killing 38 people. India's plan to develop key Iranian port faces U.S. headwinds, Reuters, 9 June 2017. ^ a b "Ports Information - Chabahar". Seas Ark S.A. Retrieved 30 June 2016. ^ a b c Aneja, Atul (5 May 2013). "India to develop Iranian port ( May 05, 2013 )". www.thehindu.com. The Hindu. India announced its participation in the Chabahar port project. ^ a b c d e f "On a railroad from Russia to Iran. ", The Hindu, 13 July 2016. ^ a b c d e "Afghanistan starts railway that will link it to the world. ", Global Construction Review, 20 September 2016. ^ a b c d "Politics of Trade Corridors. ", Dispatch News Desk, 5 November 2017. ^ Connectivity projects should be consonant with sovereignty principles: Vijay Gokhale, Economic Times, 18 Jan 2018. ^ Vatanaka, Alex (2015). Iran and Pakistan: Security, Diplomacy and American Influence. Google Books: I.B. Taurus & Co. Limited. ^ Alahmad, Nida; Keshavarzian, Arang (Winter 2010). "A War on Multiple Fronts". Middle East Report. 40 (Iran–Iraq War). Retrieved 30 June 2016. ^ a b "India determined to invest in Iranian port development projec". Islamic Republic News Agency. 20 June 2016. Retrieved 30 June 2016. ^ "Indian government firm on developing Chabahar port". Iran Daily. 20 June 2015. Retrieved 30 June 2016. ^ a b c Meena Singh Roy 2012, p. 958. ^ Chabahar Port 2013, p. 11. ^ Port of Chabahar, Iran to Port of Gwadar, Pakistan: 76 nautical miles, Ports.com, retrieved 22 August 2018. ^ a b Christophe Jaffrelot, A tale of two ports, Yale Global Online, 7 January 2011. ^ Pir-Mohammad Mollazehi, The Coast of Makran: An Arena for Rivalry among Powers, Iran Review, 28 May 2016. ^ Sudha Ramachandran (26 November 2014). "India to Invest in Iran's Chabahar Port". The Central Asia-Caucasus Analyst. Retrieved 11 April 2015. ^ Michael Tanchum (1 May 2014). "Iran's Chabahar port transforms its position". The Jerusalem Post. Retrieved 11 April 2015. ^ a b History, Chabahar Port, Ports and Maritime Organization. Retrieved 2016-05-30. ^ Cooper 2011, p. 168. ^ Cooper 2011, pp. 368-369. ^ Chabahar Port: The New Kingmaker for Indian Ocean Trade, Asian Warrior, 2015. ^ a b Chabahar Port 2013, p. 6. ^ Bhatnagar & John 2013, pp. 3-4. ^ "Iran Will Need Russia's Help to Build Its Caspian Sea-Persian Gulf Canal. ", Sputnik News, 30 March 2016. ^ Iran and India seek to revive Afghan alliance, The Telegraph, 11 August 2015. ^ Behuria & Rizvi 2015, p. 4. ^ Cheema 2014, p. 23. ^ Bhatnagar & John 2013, p. 3. ^ Chabahar port: India, Iran, Afghanistan to set up group, Indian Express, 27 August 2012. ^ a b Behuria & Rizvi 2015, p. 5. ^ Bhatnagar & John 2013, p. 2. ^ Cheema 2014, p. 34. ^ a b Bhatnagar & John 2013, p. 5. ^ a b Devirupa Mitra, With Chabahar Text Finalised, India's Dream of a Road to Afghanistan Gathers Speed Archived 2016-04-13 at the Wayback Machine, The Wire, 13 April 2016. ^ a b Sumitha Narayanan Kutty, India Cements Role in Iran with Chabahar Deal, LobeLog Foreign Policy, 23 May 2016. ^ "Easing sanctions allows Iran to develop key port project". The Journal of Commerce. 23 May 2016. Retrieved 30 June 2016. Under the agreement, IPGPL will invest about $85 million in the modernization of infrastructure at two existing cargo berths at Chabahar on a 10-year operating concession with a provision to renew the contract with mutual consent. IPGPL has guaranteed 30,000 twenty-foot-equivalent units in the port's third year of operation and aims to handle 250,000 TEUs in the 10th year. ^ "India, Iran and Afghanistan sign Chabahar port agreement". Hindustan Time. 24 May 2016. Retrieved 24 May 2016. ^ "Easing sanctions allows Iran to develop key port project". The Journal of Commerce. 23 May 2016. Retrieved 30 June 2016. IPGPL will refurbish a 640-meter (2,100 feet) container-handling facility through the deployment of new equipment, including four rail-mounted gantry cranes, 16 rubber-tire gantry cranes, two reach stackers and two empty handlers. In addition, it will upgrade a 600-meter multipurpose berth with six mobile harbor cranes, 10 forklifts and 10 trailers for breakbulk and other cargoes. ^ $400 million steel + $85 million for development of port, and $150 line of credit. ^ "Why Chabahar deal is a rebellion against history. ", Indian Express, 27 May 2017. ^ a b c d e "India opens trade route to Central Asia. ", [http://www.TheIndependent.in|Independent of India, 30 October 2017. ^ India's Track-3 Afghan-Iran-rail, Hindustan Times. ^ "The Frontier Post". Archived from the original on 2016-03-04. Retrieved 2017-11-07. ^ "India eyes Iran's energy resources, commits over Rs 1 lakh crore investment in Chabahar - Firstpost". 23 May 2016. ^ Rail Transportation, Ministry of Roads and Transportation, Republic of Iran, Retrieved 8 August 2016. ^ Khaf Herat route to open with in weeks, Mehrnews, 20 July 2017. ^ Route of the Khaf – Herat railway, Andrew Grantham, 17 October 2017. ^ a b Salehai, Zarghona (28 November 2016). "Afghan-Turkmenistan railroad inaugurated". Pajhwok Afghan News. Retrieved 17 January 2017. ^ "India eyes Iran's energy resources, commits over Rs 1 lakh crore investment in Chabahar". Firstpost. 23 May 2016. Retrieved 25 May 2016. ^ Indian Billionaires Interested in Managing Chabahar Port, Bloomberg News, 30 March 2017. ^ "Chabahar Port in Iran will be ready next year: Nitin Gadkari. ", Money Control, 9 August 2017. ^ "India cracks open Iran sea route to Afghanistan, bypassing rival. ", Economic Times, 30 October 2017. ^ "Chabahar port in Iran being inaugurated today", [http://www.TheIndependent.in|Independent of India, 03 December 2017. ^ "Iran Signs $2b Rail Deal With India". Financial Tribune. 2018-01-13. Retrieved 2018-01-15. ^ "Afghanistan Launches New Export Route To India Through Chabahar Port". NDTV.com. Retrieved 2019-03-04. ^ "Afghanistan opens new export route to India through Iran's Chabahar port - Times of India". The Times of India. Retrieved 2019-03-04. ^ a b Padukone 2014, p. 163. ^ Padukone 2014, p. 173. ^ Watching India—Iran ties 'very closely': U.S., The Hindu, 25 May 2016. ^ Padukone 2014, p. 129. ^ Hu Weijia, Indian deal with Iran shows commitment to infrastructure that will benefit China too, Global Times, 27 May 2016. ^ Shi Lancha, In Iran's Chabahar, India seeks leverage point over Pakistan, China, Global times, 5 June 2016. ^ Aamir Latif, Iran's Chabahar won't vie with Pakistan's Gwadar: Experts, Andalou Agency, 1 June 2016. ^ "Pakistan may link Gwadar to India-funded Chabahar in Iran, says Sartaj Aziz", Daily Pakistan, 27 May 2016. ^ Meredydd Rix, "Pakistan In a Frenzy Over Chabahar Port", The Citizen (New Delhi), 3 June 2016. ^ Jorisch, Avi. "Port Of Damaged Goods: India's Dangerous Investment In Iran's Chahabar". Forbes. Retrieved 11 August 2016. But additionally, India's bet on Afghanistan or Chabahar may turn out to be a poor choice. Afghanistan remains politically unstable. Any government that comes to power after the 2014 elections, if led by the Taliban or another Pakistani-supported political faction, may not be as enamored of increased trade with Iran or India as the current government is. And Chabahar is located in one of Iran's most explosive regions, where the Sunni Baloch insurgents have carried out repeated attacks against the regime in recent years. ^ "India, Iran and Afghanistan Sign Chabahar Port Agreement". Hindustan Times. 24 May 2016. Retrieved 9 August 2016. From Chabahar port, the existing Iranian road network can link up to Zaranj in Afghanistan. This road can then connect to the 218-km Zaranj-Delaram road -- constructed by India in 2009 at a cost of Rs 680 crore – and finally to Afghanistan's Garland highway. ^ "10pm News Bulletin". TOLOnews. 8 August 2016. Archived from the original on 2016-08-09. Retrieved 9 August 2016. The closure of Helmand-Kandahar Highway for the past four days - due to the presence of Taliban in parts of Helmand province – has created numerous challenges for battle-weary residents. ^ "Jundallah: Iran's Sunni rebels". Al Jazeera English. Retrieved 9 August 2016. ^ Zambelis, Chris (14 January 2011). "Back with a Vengeance: The Baloch Insurgency in Iran". Terrorism Monitor. The Jamestown Foundation. 9 (2). Retrieved 9 August 2016. Jundallah, an ethnic Baloch nationalist rebel group, has been waging a campaign of violence and terrorism in the name of local Baloch minority rights against Tehran in Iran's southeastern province of Sistan-Balochistan since 2003. ^ Zambelis, Chris (14 January 2011). "Back with a Vengeance: The Baloch Insurgency in Iran". Terrorism Monitor. The Jamestown Foundation. 9 (2). Retrieved 9 August 2016. In the most recent high-profile strike in Iranian Balochistan, two suicide bombers struck the Imam Hussein mosque in the port city of Chabahar on December 15, 2010, killing 38 and injuring over 100. ^ "Iran rud : The Great Canal of Persia". 2014-09-29. Retrieved 2017-07-07. ^ "Iran's 'Suez Canal': Tehran Could Connect Caspian Sea and Persian Gulf". Sputnik News. March 3, 2016. Retrieved April 8, 2016. ^ "Russia & Iran negotiate canal from Caspian Sea to Persian Gulf". Russia Today. April 8, 2016. Retrieved April 8, 2016. This page was last edited on 2 April 2019, at 12:54 (UTC).